This image shows an artist’s impression of the ten hot Jupiter exoplanets studied by David Sing and his colleagues. 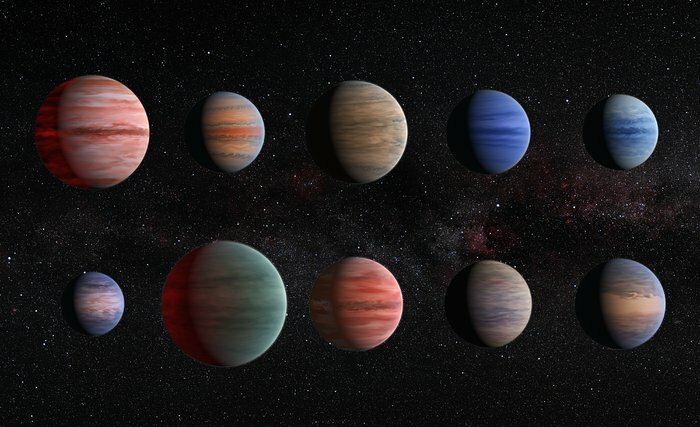 From top left to lower left these planets are WASP-12b, WASP-6b, WASP-31b, WASP-39b, HD 189733b, HAT-P-12b, WASP-17b, WASP-19b, HAT-P-1b and HD 209458b. The wind patterns shown on these ten planets, which resemble the visible structures on Jupiter, are based on theoretical models.